Case study on a severe injury, as reported and shared by Kellie Stobie. For many issues, selecting just one type of therapy can be sufficient to successfully resolve the problem. But for some types of injuries, combining several different therapies can make all the difference to achieve fast and healthy recovery. One of Matrix’s customers, who is a practicing equine therapist and a Certified Best-Vet instructor, recently had success healing a deep wound by using microcurrent, light, and infrasound. A two-year-old colt was being ponied at the track, but he startled and broke away. In the process, he tried to jump the side rail and landed on top of it with his front right leg. As is visible in the pictures, the horse was severely cut in the armpit area – the gash was about 5 inches deep and approximately 7 inches in length. Attempts were made to stitch the area but would not hold because of the movement of the leg. The area all the way through the shoulder, neck and back became extremely swollen and the tissue was filled with air, which made a crackly sound like bubble wrap. There were additional injuries, but the armpit was the most significant. 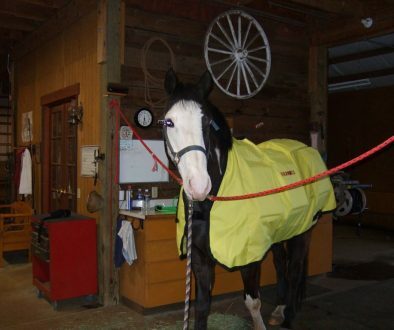 During the first week, the horse received light therapy treatments with the Matrix Laser two times per day. Because of the severity of the wound, he was too sensitive for direct contact so microcurrent was unable to be used. In the second week, the Qi Gong massager was incorporated and used around the shoulder area to address the swelling, and the Matrix Laser continued to be used to encourage quick, healthy healing. Then in the third week, the horse was treated with microcurrent from the GV 14 acupoint to a silver knit sleeve on the horse’s ankle as well as regular treatments with the laser. Due to the horse being a young and difficult-to-treat patient, the sessions were kept to around 10 minutes although ideally they would have been longer. At time of publication, the wound is still being treated with the Matrix SL-50 Laser two times a week for 10 minute sessions. The primary wound, on the day it happened. After 3 weeks & around 16 treatments. After three weeks, the picture to the right was taken. Over this time the horse received approximately 16 treatments that were each around 10 minutes in length. Everyone involved has been incredibly happy with the fast results. By combining light, infrasound, and microcurrent the horse received a combination of benefits that successfully healed the wound. On the fifth week, the horse was evaluated by the vet and given the “okay” to go back to training. Originally, the vet had said it was going to be a four month recovery time. While all three of these therapies are able to reduce swelling, provide pain relief, and support healing, each has their own specialty. Because the horse was a sensitive and hard-to-treat patient, the Qi Gong and Matrix Laser were ideal for this situation because they were able to provide relief without touching the horse. Along with the benefits of microcurrent, the Qi Gong infrasound massager was able to quickly reduce the large swelling and the light promoted fast collagen production and wound closing. Each issue and the horse you’re treating is slightly different, so it is important to adapt to the situation and select therapy tools that can achieve the best results. Thank you to Kellie Stobie, a Matrix customer and a Certified Best-Vet Instructor from Puerto Rico, for sharing this case study and photos.